It’s one of the greatest conundrums for professional and recreational athletes and sports enthusiasts alike – the more you play and practice, the better your game gets. But the more you play and practice, the greater the likelihood of suffering from a repetitive motion injury or strain. Depending on the activity, the risk for ruptures and tears to important ligaments and tendons can also increase. In the past, depending on the person and type of injury, chronic pain and mobility problems associated with an orthopedic injury might be enough to sideline the player for good. Regenerative medicine treatments like prolotherapy are offering new hope for people who want to stay in the game, and continue to enjoy the activities they love. While sports like golf and tennis are attractive to many people of all ages and athletic ability because of their low-impact, non-contact nature, they can still cause injuries and problems for the muscles, tendons, ligaments, and joints. One of the most common golf injuries for professional and recreational players is medial epicondylitis, or golfer’s elbow. Golfer’s elbow is a type of repetitive motion strain injury that affects the tendons and muscles of the wrists and fingers. Overuse, as well as improper or infrequent warm ups before activity can cause strain and injury to this group of muscles and tissue. Most people suffering from medial epicondylitis tend to notice pain and symptoms when performing gripping motions and flexing the wrist. While some cases may respond to conservative treatments like rest, icing, and over the counter pain relievers, chronic pain and swelling may benefit from prolotherapy treatments. In addition to golfer’s elbow, board-certified orthopedic surgeon Dr. Steven Meier and his team in Beverly Hills are using prolotherapy to treat orthopedic injuries, as well as chronic lower back, knee, hip, shoulder, and joint pain. In addition to being a non-invasive, non-surgical treatment option, prolotherapy can help to accelerate the healing process, even when administered some time after the initial injury has occurred. Ligaments and connective tissue can be more susceptible to injuries because they have less blood flow than muscles, and often bear most of the force of joint movements. They can also be slower and more resistant to healing with conservative and traditional treatments. This makes connective tissue injuries ideal for advanced treatment with prolotherapy. Prolotherapy (proliferation therapy) uses the body’s naturally occurring growth factors to stimulate healing and repair in damaged ligaments, tendons, and joints. Administered via injection and also referred to as regenerative injection therapy and tendon and ligament reconstruction therapy, the growth factors used for the treatment can be obtained from bone marrow, or fat tissue, which also contain regenerative stem cells, and dextrose. Because prolotherapy uses naturally occurring stem cells and blood from the patient, it is a mild treatment procedure with negligible side effects in most patients. Classic dextrose prolotherapy – The original form of prolotherapy, this form uses a sugar or saline solution injection to stimulate a healing response in the body in order to increase immune and growth factor activity at the site of injury. Stem Cell Prolotherapy – Stem cell prolotherapy uses mesenchymal stem cells found in bone marrow and adipose (fat) tissue, along with growth factors to stimulate an advanced healing response in the body. Platelet rich plasma (PRP) prolotherapy – This form uses a sample of the patient’s own blood to create a higher concentration of platelets and growth factors, which are then administered via injection at the injury site in order to turbocharge healing of the damaged joint or ligament. 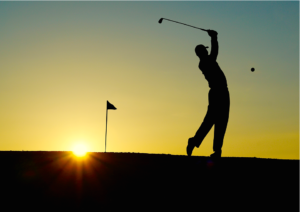 To learn more about the benefits of prolotherapy in treating orthopedic conditions and sports injuries like golfer’s elbow, contact Meier Orthopedic Sports and Regenerative Medicine at 310.504.2988 to schedule a consultation today.